PAX BRITANNIA: NEVERLAND - Here Be Monsters! 3 days to go! NEVERLAND - Here Be Monsters! 3 days to go! 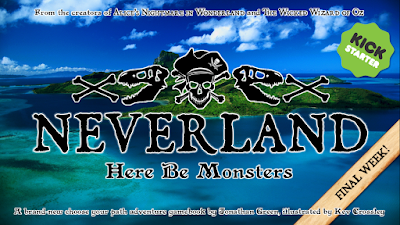 NEVERLAND - Here Be Monsters! is down to its final three days of funding. I've you've yet to back my new gamebook - which merges J. M. Barrie's Peter Pan and Wendy with Sir Arthur Conan Doyle's The Lost World, and gives the whole a steampunk twist - make sure you don't miss out and back today!